A pretty famous cartoon above. And it came to mind after I read this at Fox News. In order to test whether dogs can visually categorize pictures, and transfer their knowledge to new situations, four dogs were shown landscape and dog photographs, and expected to make a selection on a computer touch-screen. 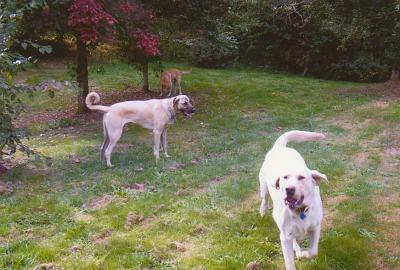 In this test, the dogs had to choose between a dog-on-landscape image and a landscape-only photo. Good doggies: They aced the test, selecting the images that included dogs. The results indicate, according to the authors, the dogs were able to form a concept of a "dog." 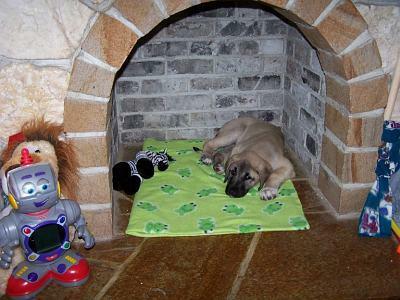 Whether the dogs recognized the pup pictures as actual dogs, however, is an unknown. Okay, a more serious perspective. 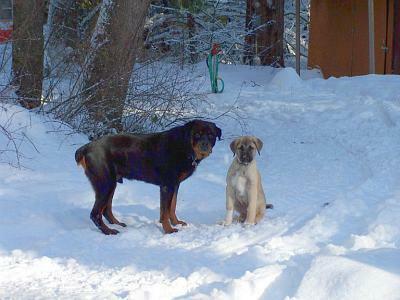 I think that our dogs are a lot more aware and perceptive of things than we are prepared to recognize sometimes. They do amazing things in search and rescue and in more everyday facets of life. It's just that it is us humans are sometimes unwilling or unable to take notice. Or if we do, other people think we are nuts. I think I'm in good company. Heehee. It's always nice when those not familiar with the intelligence of dogs finally catch on to what we know. Humans just need to learn how to build good tests. Boy, that's for sure. I remember reading the news about one you recently blogged, where some study tested to see if dogs would respond to emergencies. 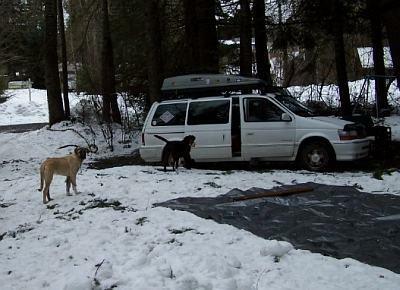 The testers staged fake emergencies and the dogs didn't fall for it. I was wondering after reading that one, if there could only be a test to test the common sense of people who design such studies. Of course, there are still pet lovers that seem to have the impression that if you fake a seizure or a diabetic coma, you can train a service dog to alert to a real one. The relationship between diet and how sharp your brain could be. Interesting 'food for thought' from Science Daily regarding the relationships of high or low folate, with B12. B12 is found in animal foods such as eggs, poultry, dairy, fish and meat. Folate is abundant in greens and citrus. If one has a diet emphasizing high Folate level, normal levels of B12 are essential. Having a HIGH folate level and low B12 leads to problems regarding nerves and proper function of gray matter and cognition. Loss of bone density, difficulty coping with stress and anemia are associated with low levels of B12 as well. Inability to cope with stress can be especially problematic. Cobalamin deficiency renders folate largely biologically ineffective, although its plasma concentrations and distribution appear sufficient. While some people often have poor diets to begin with and consume depleted processed foods, the main thing I take away from this, in light also to increased diabetes in our society is that that the increased emphasis on moving away from animal sources of food may well be compounding problems in the bigger picture. ...The researchers found an interesting association among seniors aged 60 and older whose vitamin B12 blood levels were low. Aging and taking stomach-acid blockers can contribute to a gradual lessening of B12 absorption in the body.
. . . between 1999 and 2002, Morris and colleagues found that people with normal vitamin B12 status and high serum folate, which is a measure of folate in the blood, had higher scores on a test of cognitive function. Blood tests were used to determine folate and vitamin B12 levels, and the cognitive function test assessed aptitudes such as response speed, sustained attention, visual spatial skills, associative learning, and memory. Cognitive impairment was identified when a subject fell into the bottom 20th percentile of the distribution on the test. ". . . people with low vitamin B12 status, high serum folate was associated with poor performance on the cognitive test." Seniors with low vitamin B12 status and high serum folate were also significantly more likely than seniors in other categories to have anemia, a condition caused by reduced amounts of hemoglobin in oxygen-carrying red blood cells, or by a deficiency in the number or volume of such cells. "For seniors, low vitamin B12 status and high serum folate was the worst combination," says Morris. "Specifically, anemia and cognitive impairment were observed nearly five times as often for people with this combination than among people with normal vitamin B12 and normal folate." Vitamin B12 deficiency, which affects many seniors due to age-related decreases in absorption, can impact the production of DNA needed for new cells, as well as neurological function. See the articles for the full context. The bloge was very informative and by this information we can stay healthy. I always knew about Folate and vitamin B12 but was never able to relate between them. Thanks! iTunes has been trying to upgrade itself on both my laptop and main machine. Each time, there is a failure because iTunes.msi which comes with the upgrade installation, isn't recognized. Even if you find it (via Browse) ... no dice. grrr. I uninstalled it, thinking a clean install would fix it. ...but nooooooooo... bleah -- I'd rather not be wasting my time on iTunes! (I can't hear anyway) But hubby needs it, so that's that! Anyway, here's the trick to fix that and it takes only a few minutes after you get the download. WOW, this is a fascinating piece by Julia C. Mead at The Scientist Daily. It is a very interesting and well written piece. A mystery about deaths that have swept selectively through certain regions of the Balkans; missing some people and villages while taking many others; people who tried to escape the black houses could be overtaken eventually. The folk explanation of it and the treatments which still do not result in a cure now have another layer of clues... molecular biology has added important elements to resolving the mystery. Fascinating! Articles tend to go to pay per view or cache sometimes, so you have to move quickly on this if you want to read it. Like the mysterious illness in the novel The Andromeda Strain by Michael Crichton, this article about a real and deadly disease captured my imagination about its ongoing tragedy. You can catch the article now at this link. Fascinating article! Thanks for posting it. A modern model of a similar endemic in the Middle Ages, Ergot in the grain. Just goes to show, everything "natural" isn't necessarily good for you! When the voices of extremists can strong arm our democratic process with use of funds accumulated via deception. When extremists can use this financial clout to broadly and wrongly profile populations as HIGH RISK for lifestyles not tolerated by these vocal extremists. When extremists are successful in manipulating our legislators to enact wide reaching, selectively enforced and prejudicial legislation. And when the voices of the citizens to be affected are completely ignored by our legislators... something has gone terribly wrong. US Constitution also guarantees people pursuit of happiness, which many animal owners haven’t been able to exercise lately because they have been too busy fighting all the crazy animal legislation. Constitution also guarantees people property rights: lands and animals are some of the most ancient type of properties. Many new laws are messing with both of them, with peoples’ right to use their land without government interference and with their right to choose the types and amount of animals. It is time to Legalize the Constitution in the USA. Our enemies, extreme animal rights (AR) activists groups, are getting stronger and more successful at passing bans regarding how many and what species or breeds of animals we can keep, and often mandating forced sterilization of domestic pets. It doesn’t matter if you only own one hamster, horse, domestic dog, or cat, these unfair bans will eventually affect us all, since we all have a common enemy: extreme AR groups whose final agenda is no animals in captivity, no meat on our plates and no leather good in our houses. They want to remove all animal and human contact. Year 2007 alone brought too many mandatory spay/neuter, breed specific legislation (BSL) and anti exotic animal bills and bans to many states, localities and even federal level. In too many cases the uneducated legislators and extreme animal rights groups have been winning and responsible animal owners losing their rights to keep the animal of their choice. Property is not a dirty word, it signifies something people love, value and cherish, and often have to work hard for. Keeping legal status of animals as property also guarantees that animals can’t be stolen from their loving owners without consequences. If we, the animal owners, continue the trend of doing nothing noteworthy in legislative area we, animal owners, are going to be extinct soon and we have only ourselves to blame. Make sure your ‘animal votes’. Choose the animal owner and animal welfare (not animal rights) friendly candidate. Educate the legislators, friends and family, so they don’t get gagged by the anti animal propaganda. United we stand, divided we fall, regardless of the breed or species. Just say NO! to anti animal ownership laws. Say YES to Legalizing the US Constitution. REXANO is dedicated to the Responsible Exotic Animal Ownership while protecting public safety. Powerful!!! Can we be extremist Constitution lovers? "I want your animal's gonads" provided some comic relief, but it puts the mandatory s/n bills in perspective. Happy dog stories always make me smile! Northern Manitoba dogsled team has the blind leading the not-blind. 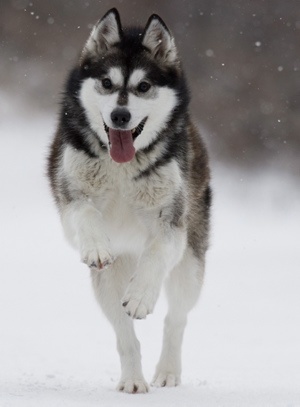 Isobel, a six-year-old husky cross, has all the great qualities of a sled dog. 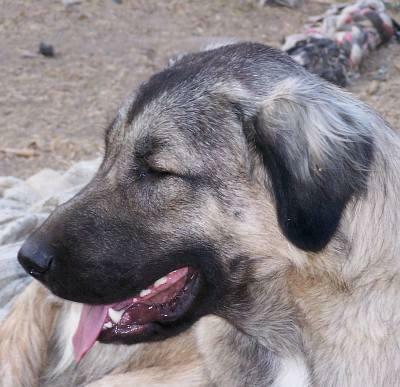 She loves to run, has strength and endurance, and works well alongside the other dogs tethered to the sleds that take tourists out on the subarctic terrain of Churchill, Man. It takes a while for visitors to notice that she is completely blind. "The dog lost its vision, but it didn't lose its spirit," Dr. Evan Fisk, Isobel's Winnipeg-based veterinarian said in a recent interview. "It can smell, hear and feel other dogs nearby." Isobel not only follows other dogs on the sled team owned by Jenafor Ollander and her common-law husband, she sometimes runs lead in tandem with another husky. "She runs tours every single day right now ... and we have tourists from all over the world that are absolutely amazed," Ollander said. "I'm sure some of them think I'm crazy when I tell them she's blind." Isobel wasn't born blind. Everything seemed fine until one day three years ago, when she suddenly came to a halt in the middle of a sled run and started staggering around. "We hooked her back up in her house and noticed that both of her pupils were completely dilated," Ollander said. "I remember a couple of people mumbling, 'What good is a blind sled dog? You should just take her out and shoot her.' And I'm a bit stubborn in nature ... and I said, so what if she can't be a sled dog? she's a good dog." Isobel was taken to Winnipeg, where Fisk noticed her retinas had detached, possibly the result of a virus. Back in Churchill, Isobel was kept indoors. Ollander figured she would be happy and safer inside. "She stopped eating and drinking and we were quite concerned about what was going on," Ollander said. 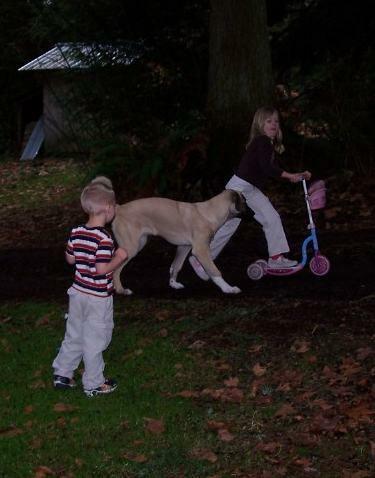 "We happened to bring one of our other sled dogs home, and she perked right up. So it dawned on us that the problem was she was depressed and she missed her pack more than anything else." Isobel was soon reintroduced to her canine comrades and her behaviour improved right away. She started eating and drinking again. 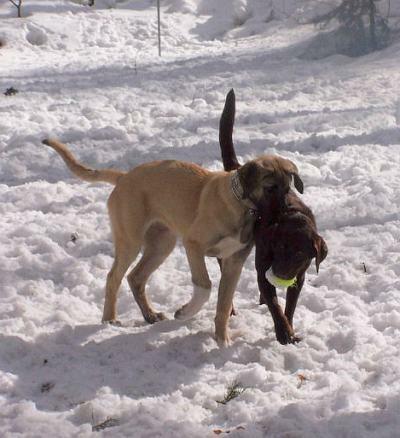 With some hesitation, Ollander's husband decided to take a chance and hook Isobel up to the sled team and see what would happen. "That dog ran like you wouldn't believe. She ran better than when she had her eyesight," Ollander said. Isobel has been running ever since. 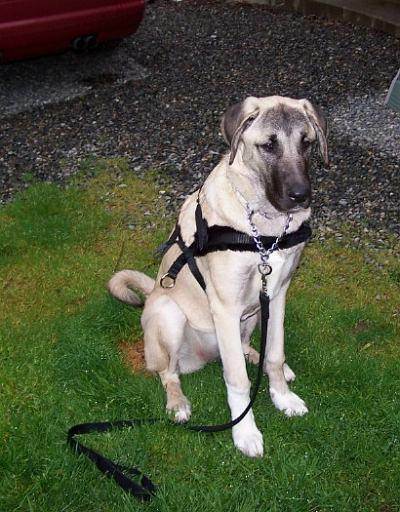 She relies on the other dogs, human vocal commands, and her other senses to avoid obstacles. It's not a complete surprise for Fisk. "I believe that their senses adapt and they adjust, just like a person," he said. "We know that people hone in well on their hearing skills and their sense of vibration and time and distance and smell and everything like that. And dogs become really acute at that. When they lose their vision, the rest of their senses kind of take over." Isobel is sometimes put up front with another dog for races, and has beat other dog teams in head-to-head competitions. She still has a couple of good running years left in her. But she's already nearing the age when many sled dogs hang up their harness. Finding a good home for her might be a challenge. "We've had several people who've offered to adopt her ... but we're really concerned because she just loves to run," Ollander said. "We want to make sure that she doesn't end up in a situation where she gets depressed again." "She's OK in the dog yard where she has her dog yard buddies." And isn't she a beautiful girl! Amazing beautiful dogs. AKC registerable! Don't fall for for a lesser "doodle"! 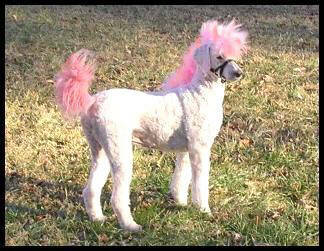 An original creation by Carol Beresh at DogsInStyle. A significant amount of our immune systems is in our digestive tracts. It's a very complicated subject but the main idea to take away is that your body and its health is highly influenced by what you consume. This would be true for dogs too, but since the video is about people and this is an area of interest for me, I'm talking primarily about humans. Western medicine is not all bad. It has outstanding ability in the treatment of trauma and surgery, but it really has made little progress in the area of understanding what is needed to produce and maintain healthy bodies. This lack of progress in the latter areas has resulted in red herrings (false assumptions) becoming the foundation upon which other theories and fallacies of health are are borne. Because our country has such an outstanding reputation in surgical and trauma care, many other countries may sometimes assume that our preventive care is also up to par. This has not been borne out by annual studies by the World Health Organization (WHO). In fact the USA often lags by tens or more behind other countries regarding the relative health of individuals, lack of "age related" disability and the having longevity not impaired with disability. These differences are changing as more countries adapt "better living through chemistry" (prescription drugs) and more of our standard dietary practices and fallacies. While the video below doesn't have captions so I can read what is being said, I'm familiar with the concepts behind the subject matter to post the video here. I urge more people to review what they may have been lead to believe in these areas and other areas of symptom treatment, such as gut problems. If after seeing the video, you'd like to read more, go and check out the website of The International Network of Cholesterol Skeptics (THINCS) if science is your thing. More generally, and easier to read, I also highly recommend Weston A Price Foundation as a resource upon which to review concepts ideas regarding better health. None of these groups are going to try and sell you something but do try to educate you on choices you may not have considered. It is only when our mainstream citizen is informed, that changes in this pattern can happen. The video: Dr Malcolm Kendrick speaks about World Health Organization data gathered in their MONI-CA study. I do have a scan from Dr. Kilmer McCully's book, "The Heart Revolution", which may help you understand why processed foods can be nutritionally lacking. Additionally, a favorite link that helps one build on the malnutrition angle is a book review of Dr. Weston A. Price's "Nutrition & Physical Degeneration". Before you actually read the latter book review in whole, just look at the photos and captions on these people -- and if it interests you, go on and read the book review. The skeleton reflects the health of the body as it develops and teeth are part of it, which is why Dr. Price studied teeth to assess the health of the people he visited in the 1930s. After checking out the teeth, read the rest of the book review by going to part 1 (in the link at the top of the page). Check out those teeth! Jasmine in a winter scene last year in Washington state. Jasmine is a spayed littermate sister to Coco and Helmut (born Oct 2006) and I recently got new pics of her, Yay! First some older pictures of her during her first year and a pic of her at one year while she plays with her neighbor doggie friends. Some puppies are ball driven. Others are driven by ball driven puppies. Jasmine with an awesome older friend and mentor named Sam. Sam now watches over Jasmine and family from Rainbow Bridge. Through thick and thin over the years before Jasmine, he was a bracing, comforting, loyal, loving, guardian and friend. Sam will never be forgotten. Jasmine with friends in one of the most recent pics at one year of age. Will They Ever 'Get It'? Thoughtful comments on HSUS & Wayne Pacelle, by Gina Spadafori at the Pet Connection Blog. I'm looking forward to Christie Keith's follow up article at SFGate on Nathan Winograd's talk about "Redemption". It will probably be in the "Your Whole Pet" November 2007 archive here. The book is on my reading list, when I get a chance. I've another post on Winograd here. Scary! Check it out at WIRED. I'm reminded of a Beavis and Butthead episode along the same lines. Except that was, you know, not real. Well, people do put dogs into crates to blow them dry with huge blowdryers. But this is just a bit much. Might be the solution to giving a cat a bath, however. ;) j/k! "Get one step closer to being a master BBQ chef"
Troubleshooting weird computer problems sometimes involves online searches for solutions. 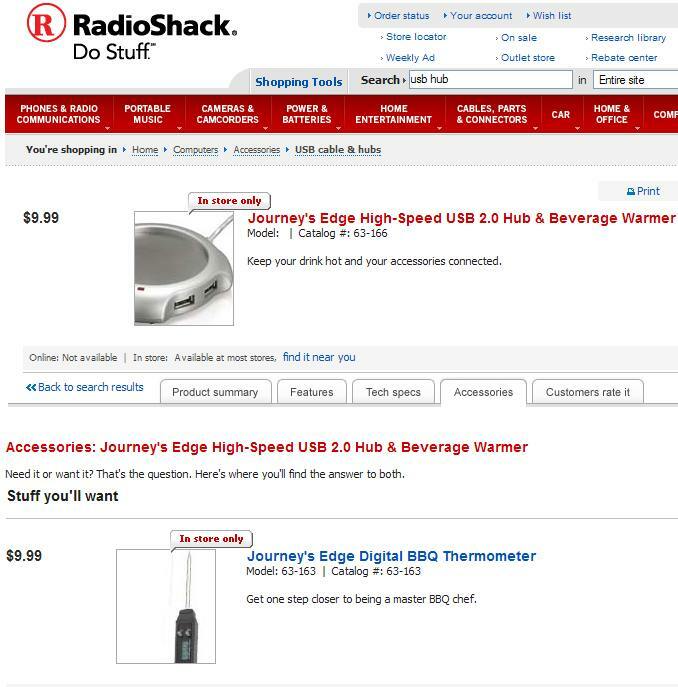 While I was looking for a solution, one message board suggested a Radio Shack product and gave a link to the item. 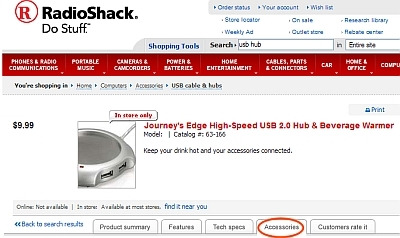 Unfortunately the link was broken because the item is no longer offered, but I started to look around the Radio Shack offerings in the same category and found an item that had me laughing. It is a USB powered coffee mug warmer which acts as a useful hub, offering four additional USB ports. "Keep your drink hot and your accessories connected." While this wasn't what I was looking for, it still had me laughing, partially because of the frustration I had for the problem. But here's the real kicker for me... I noted there were tabs, one offering 'accessories' for the mugwarmer. Okay, so, what sort of accessories does a USB mug warmer suggest? I look at the accessories and find the first item offered is a Digital BBQ Thermometer.